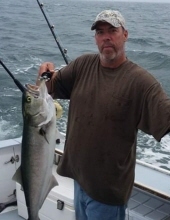 Celebrating the life of Paul Raymond McHugh Jr.
Obituary for Paul Raymond McHugh Jr.
Paul Raymond McHugh Jr., 51, of Hubbardston, formerly of Maynard, died on Sunday, March 24, 2019 at Heywood Hospital in Gardner. He was the beloved fiancé of Cindy Berlied and the devoted father of Shannon McHugh, both of Hubbardston. Born in Concord on March 3, 1968, he was the son of Pamela (Warner) McHugh of Lancaster and the late Paul R. McHugh, Sr. Ray graduated from Maynard High School in 1986. Ray lived his life with an incredible work ethic and passion for fishing. He was a lifelong, talented stonemason, who loved his German Shepherds. He also enjoyed tending to his garden and was a longtime member of the Maynard Elks. In addition to his fiancé, daughter, and mother, Ray is survived by five siblings, Triccia, Colleen, Bill, Terry, and Kara, as well as several nieces, nephews, aunts, uncles, and friends. Family and friends will gather for visiting hours in the Dee Funeral Home, 27 Bedford Street, Concord Center on Friday, March 29th from 10 am to 1 pm. Burial will follow at Glenwood Cemetery in Maynard. "Email Address" would like to share the life celebration of Paul Raymond McHugh Jr.. Click on the "link" to go to share a favorite memory or leave a condolence message for the family.